Be realistic. This is a bonus, a courtesy, a gratuity. It’s a thank you and a motivational tool at the same time. What it is emphatically NOT is a lottery ticket. Don’t get greedy and ask for an outlandish amount. Being modest in this case is in your best interest. If you low-ball yourself, what’s the worst that can happen? Answer: you get that amount. There’s always a chance your boss will go higher. Consider the company’s position. Do not – ever, ever – approach the subject of a bonus without having a good idea of the company’s general health and financial situation. If times are tight, the last thing your boss will want to hear is a request for more money. On the flip side, if you have an idea of how well your company is doing, you can calculate a proportional request. Write down a proposal. Calculate the facts and figures and put it in writing. You want to suggest a bonus of “x” by showing that you delivered “y” amount to the company’s bottom line. Maybe you wooed that big client… or brought in that big project under budget. Make a list of all the tangible ways you’ve been an asset this year. Make Them Want To Thank You. Once you’ve established all the ways you’ve really helped the company excel this year, then you can make the implied argument that a gratuity is in order. Make Them Want To Motivate You. Your presentation is not complete without a word or two about how your exceptional run of good work will continue on into the new year. Maybe this is a time to outline your plans for the next six months or so. Wow them with your initiative and ambition and they’ll be happy to pay you to keep doing what you’ve been doing. I am about to recieve my first apprasial (two months late due to changes in the company’s system). My boss has mentioned a “substantial” wage increase. As negotiation point I would like to discuss a bonus for past performance perhaps in lieu of a large percentage of the raise (regardless of the tax consaquences). Comments? 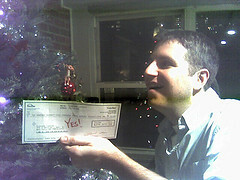 Since I got into my current job, I helped the company boost up over 70% and more of gross incomes during the year 2008. By the nearly end of its year, my boss got a pay rise himself. We didn’t. The worst of all, we had nothing at all as far as our end of year bonus goes, nor food or gift, zero. My boss act as nothing happened, even I’d showed the amount of works I’d put in during the year along the way, and gone to Xmas holiday day before us employees. It’s a great tips you’ve mentioned above, but for a boss who only thinks for himself, I wouldn’t think this method would work for this type.